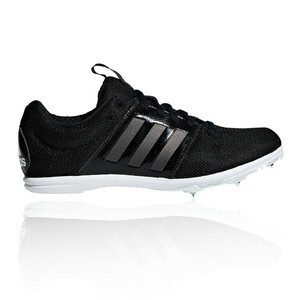 For junior athletes competing in running and jumping events, these multi-event spikes can do it all. Durable and breathable for maximum performance across a number of events, these shoes have a mesh and synthetic upper and a lightweight midsole. The upper of the Allroundstar is constructed from a highly breathable synthetic and mesh upper. The lightweight, breathable mesh provides brilliant protection and breathability. Cool air is encouraged to permeate the fabric to remove uncomfortable heat build up whilst sweat is able to leave the skin and transport itself to the surface of the shoe creating a healthy environment for little feet to thrive in. A traditional lace system allows for a secure, customised fit whilst the pull tab is designed for easy on/off wear. The padded collar ensures that the shoe sits comfortably against the foot eliminating any uncomfortable rubbing and chafing from hard edges so that your little ones can concentrate on creating new personal bests. A full-length, lightweight EVA plate ensures stable cushioning and responsiveness to give for a smooth, responsive ride. Light in weight and low in profile, it spares small, growing joints and attenuates shock when striking down onto hard, unforgiving surfaces.